Let’s start with a simple question: Does your organization’s website advance your business goals and make you proud? If the answer is “yes,” congratulations— you’ve probably worked very hard to get to this point. For everyone else, particularly in the nonprofit community, the answer is frequently somewhere in between “I’m not sure” and “no.” Common constraints around time, capacity, and budget often lead to the misperception that a great site is too far out of reach. I’d like to reject that premise. Even if barriers exist, there’s every reason to begin drawing the roadmap to a site that moves your organization forward in an ever-changing—and often competitive—digital landscape. At African Wildlife Foundation, we embarked on an ambitious project that started humbly as a “simple website redesign” and evolved into a totally reimagined digital brand that included the new website. Let’s take a look at some lessons learned and key considerations as you begin to reimagine your own site. Your organization’s website isn’t just a repository of connected information that happens to reside somewhere on the Internet. It’s the primary vehicle by which new audiences will find you, learn about your mission, and engage with your brand. Begin by defining some key objectives you hope to achieve through the redesign. Remember that while every site’s goals are different, they all share one common objective: to build trust between visitors and your organization. Long before you start thinking about visual identity, it’s critical to consider your goals for the site and how those goals relate to your key audiences. After you’ve reached consensus, build audience personas to walk through the individual journeys you’d like to offer when someone visits the site. What does a casual visitor want? How can you deepen that relationship? Are these the same things an existing major donor needs? You’ll find by clearly outlining these goals and identities, you’re often building the business case to justify investment to key stakeholders. It can be tempting to think of a website “redesign” as just that—a new design. However, it’s also your chance to address those nagging concerns about the extent to which your site conveys the breadth and importance of your work. 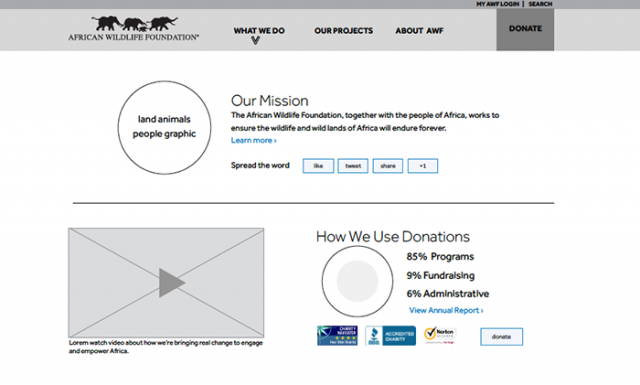 While planning the redesign of awf.org, we decided to start from scratch, beginning with the site map itself. What really belongs in the site’s navigation? What are the top-level categories, and how deep does the structure need to go? As you move into individual sections, it’s helpful to conduct a gap analysis to identify opportunity areas to develop new content of interest to key audiences. Wireframing can help you to make decisions about individual page elements and keep unnecessary clutter out of the navigation, resulting in the best user-centered design approach. Mapping the site out ahead of time will help manage internal expectations and keep the content focused, hierarchical, and accessible. Ultimately, providing compelling information about your work and impact will help move prospects further down the conversion funnel toward a defined goal. Those could be anything from acquisition (e.g., a simple email capture) to the final decision to make a gift. As you move through this process, there’s one often-overlooked, but critical consideration: SEO preservation. Your existing content has been indexed by Google (and Bing, etc.). This includes everything from the homepage to individual images. If the site’s been around for a while, it’s likely others are linking to your content and sometimes even including your image paths in their code. Each of these references constitutes a single inbound link. On aggregate, inbound links are one of the most important, and persistent, factors Google uses to determine your site ranking. Either index your existing content manually (which is extremely time-consuming) or use SEO spider tools to automatically catalog the site. You can then map the current inventory to what you think would be most relevant on the new site and create comprehensive 301 redirects. This will effectively prevent the loss of inbound links and lead people to the new content you’ve worked so hard to create. Most importantly, it avoids the crushing blow of excitedly launching your site and watching site traffic plummet. Good thing you planned ahead. The design of the site can range in scope from moving to an easy-breezy wide grid to a full rebrand of the organization. The latter can often be an unintended, but very positive, result of a successful design approach, that creates a visual language to express the goals you’ve already defined through effective research and planning. Irrespective of the scale or budget you put behind the design itself, it’s important to understand rapidly changing technologies and how they affect user behavior. It was pretty common back in 2013 to hear the phrase, “mobile is maturing.” Since that time, mobile has matured, graduated college, and is now looking at competitive graduate programs. Mobile web usage now exceeds desktop at over 50%, which wasn’t expected to occur until 2016. You may have written the most compelling content in your vertical, but if someone on the subway pulls it up and has to pinch or zoom, you’ve likely already lost that prospect. In markets like Mainland China, many companies are skipping desktop design altogether and adopting a mobile-only approach. What does this all mean? 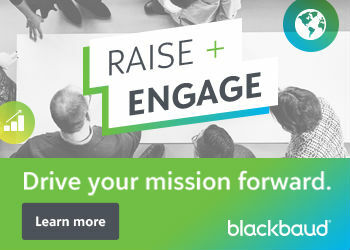 Desktops are no longer the primary vehicle potential donors will use to learn about your mission. It’s important to ensure a consistent branded experience across each device. We must adapt to an era of proliferating connected devices and complex consumer behavior. I try to keep one simple thing in mind: Your content should exist irrespective of the context. There are a lot of important considerations when approaching the redesign of your site. It’s an incredible opportunity to reach new audiences and deepen engagement with existing constituents. A well-planned effort can go beyond incremental improvements to become transformative, serving as a catalyst for new discussions and organizational change. Hopefully you also had some fun along the way. David Onate is Director of Marketing at African Wildlife Foundation (AWF). Since joining AWF from Discovery Communications, David’s role has grown to encompass strategic planning and management of organizational marketing, creative, and fundraising strategies. David spent over ten years living in China and volunteers time to help local arts and community-focused small businesses build strong brands and develop marketing strategies.